Hi friends! Happy Thursday I hope all of you are having a good week! Today I have a product I'm super excited to share with you all. A while back the Royal Air had become much more strict with their regulations and polish coming out of the UK was near impossible. I was so bummed when I heard about it because I love to swap and there are some really amazing brands, big names and indies that are only available in the UK. For some time I gave up on the idea of purchasing or swapping polishes from the UK until I came across an indie maker who came up with the most brilliant idea ever, dried polish! Who would've thought the answer was that simple! Hilary runs and owns Nelly Polish and she sells the world's first dried polish. The approach is so simple, Hilary sells dehydrated polish already mixed with colour mica/pigments, glitters and mixing balls without the base which makes it completely safe to ship overseas. 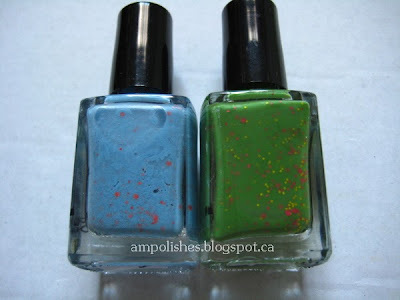 When you receive the mix all you need to do is add clear polish, shake and ta-da! She offers her polishes in 3 different options, regular premixed polishes priced at $8.92USD, the dried polish in bottles priced at $7.30 or just the dried polish in a packet priced at $4.87. So not only is the idea ingenious, it is very affordable. The process very simple and fun to do, the package included easy to follow instructions. Hilary kindly sent us Beeny and Looe for review. 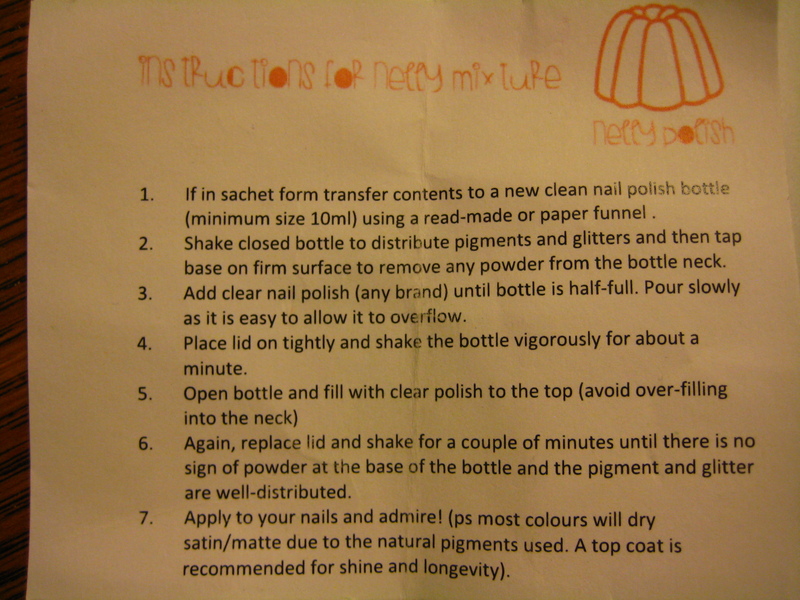 For Beeny I followed the instructions closely, added polish to the bottle and shook like crazy. I had to pour a little in at a time because the dried polish took up 2/3 of the bottle. For Looe I decided to dump out half of the dried polish first, add polish, mix and then add the remaining dried polish back into the mix. I found that method, although messier mixed better. The entire process was really fun but I sugguest to do the mixing in a well ventilated room or outside. Click to see how the polishes turned out! Beeny is described as a cornflower crelly with orange matte glitter. I had to use 3 layers to achieve opacity, it applied well and layered nicely. I think with a base colour only one layer of Beeny would be needed! The polish dried matte and looked very lovely after a layer of topcoat (I think Hilary mentions on her shop somewhere that all her polishes has a matte finish). 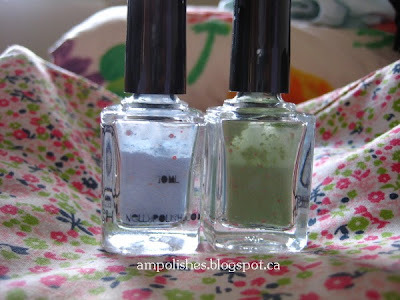 Looe is descrived as a spring green crelly with hot pink and yellow matte glitter. I used 3 layers to achieve opacity but like Beeny I think with an under colour you can get away with 1 layer. I really loved this look, the colour combination reminded my of Christmas...like a Christmas tree with lights and decoration. I used one layer of topcoat and that got rid of the slight grittiness of the glitter. Overall I was very impressed with the polishes and it felt very gratifying mixing my polishes lol Although if I had the choice I would've prefer to add the powder to the liquid, I feel as though the pigment/mica powder would've dissolve better and more evenly that way. 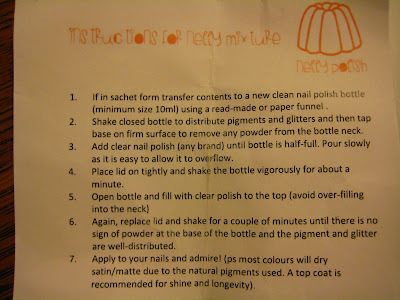 Nelly polishes can be purchased on Hilary's etsy store or on her website. The polish bottles are 10ml in size, if you purchase the dried polish packets you will need at least 10ml of clear polish. Prices range from $4.87USD to $8.92 depending on the option you choose. 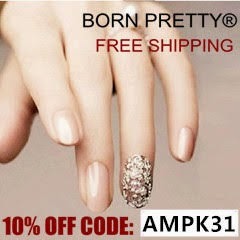 Currently Nelly Polish has a coupon code for 20% off your entire purchase, there is no note about when it ends so act now and buy soon! Use code SEPT20 when you check out. Hilary has just released more really awesome colours, you really have to check them out! That's some cool polish! Such a neat idea! Such a simple solution! Love it.